Stella obtained her Bachelor of Dental Science with Honours from the University of Melbourne. Upon graduation, she partook in an internship program in various community dental clinics throughout metropolitan, regional and rural Victoria, where she gained further skills in minor oral surgery, and management of trauma and medically compromised patients. Stella firmly believes that oral health is fundamental to general well-being and quality of life. She endeavours to provide comprehensive dental care with a personalised and preventive focus. Dental visits can be scary and stressful for many children and adults alike. With a gentle and caring approach, Stella is dedicated to help her nervous patients walk out with a confident, transformed smile. Upon graduation she partook in an internship program in various community dental clinics throughout metropolitan, regional and rural Victoria, where she gained further skills in minor oral surgery, management of trauma and medically compromised patients. 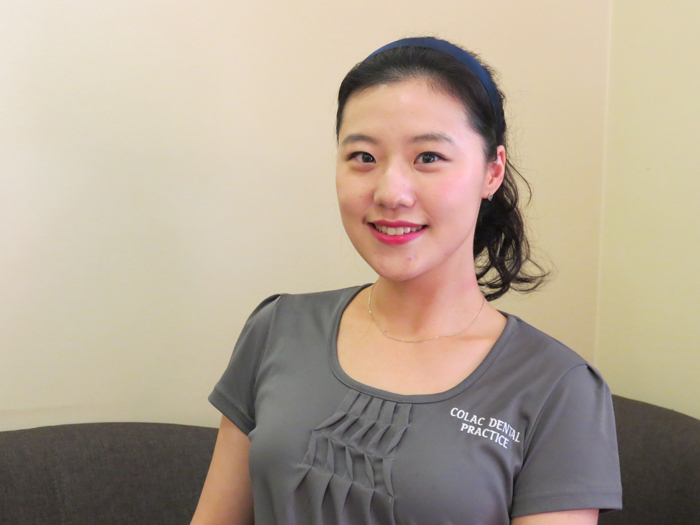 Stella joined Colac Dental Practice in 2014.